Floral embroidered scroll cover with frame mat and rounded spine. Bi-directional pages hold 2 horizontal or 1 vertical 4x6 photo. 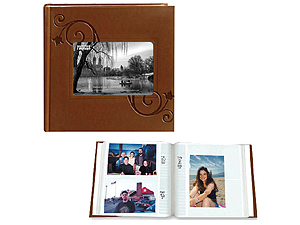 This bound album features a leatherette cover with a black cloth liner and holds up to 200 photos. Overall dimensions: 9" x 9-1/2"